The art scene in Sydney is highly developed and the city comes with a huge selection of galleries and art-related museums, the majority of which are completely free to enter and browse at your leisure. Overlooking the harbourfront, the Artspace Sydney ranks amongst the best and this leading Visual Arts Centre features a large number of artist residencies. 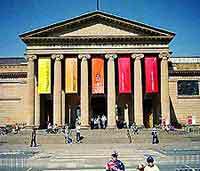 One attraction not to be missed is the Art Gallery of New South Wales (AGNSW), which was founded in 1897 and is known both for its plentiful Australian artists and for hosting the prestigious Archibald Prize. The Museum of Contemporary Art (MCA) is another gallery of great note in Sydney and is located within the stately Maritime Services Board Building, next to the Circular Quay. Nearby you will find the Djamu Gallery, which resides on the Circular Quay and was established in 1998, earning itself quite a reputation for its exhibitions relating to indigenous Australian culture. Located on Observatory Hill, the SH Ervin Gallery is yet another important art institution in Sydney and where you will find some of the art works rejected by the Archibald Prize (Salon des Refuses). The Artspace is to be found in the Woolloomooloo area, close to Potts Point and the Woolloomooloo Bay Hotel, and is a cutting-edge facility with many spectacular contemporary paintings and sculptures. Focusing on modern Australian culture, the Artspace plays an important part in the city's colourful cultural scene and regularly hosts important exhibitions. 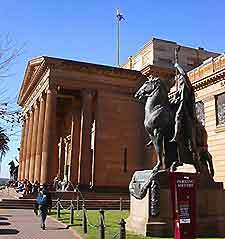 Close to the St. James train station, the Art Gallery of New South Wales is home to an impressive collection of 19th- and 20th-century Australian art, Aboriginal art and also European and Asia Art, some of which dates back to the 15th century. Other attractions here include free guided tours each day at 13:00, Aboriginal dance performances at 12:00 from Tuesday to Saturday, and numerous rotating exhibitions throughout the year. The Art Gallery of New South Wales is easy to find, being situated within the Central Business District, nearby the Parliament building and the State Library. Located in the eastern suburbs of the city, the Australian Centre for Photography is a non-profit organisation, with highly regarded temporary exhibitions of photographs and photography-related art. This facility supports local up-and-coming photographers in the Sydney area and actively promotes their work on the 'Project Wall'. Other highlights at the Australian Centre for Photography include a large library, a popular French-style café, darkrooms, studios, instructors and the gallery's magazine, Photofile. The centre can be easily reached by bus numbers 378 and 380. The popular Caspian Gallery stands along the busy Oxford Street, in the city's vibrant Paddington area and close to the Paddington Markets. This large, commercial venue is full of affordable works of art, including many ethic sculptures, artefacts, paintings and Aboriginal tribal art work. The Djamu Gallery is situated in the Central Business District (CBD), within Customs House. Celebrating the importance of both Sydney's past and future, the Djamu Gallery is home to a wealth of artefacts, important Aboriginal works of art, historic paintings and also many modern paintings and sculptures. Other attractions include a gift shop and highly regarded temporary exhibitions of art throughout the year. The Djamu is conveniently close to the Circular Quay train station and the George Street bus stop. 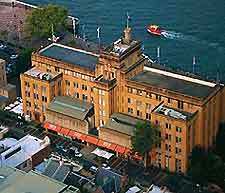 The important Museum of Contemporary Art (MCA), in the Rocks area, is housed in an Art Deco building at the front of the Circular Quay West, nearby Dawes Point. With a fine collection of modern art from Sydney, Australia and throughout the world, exhibitions at the Museum of Contemporary Art (MCA) include paintings, sculptures, moving images and installation art work. There is also a gift shop, popular café, regular lectures and seasonal events. 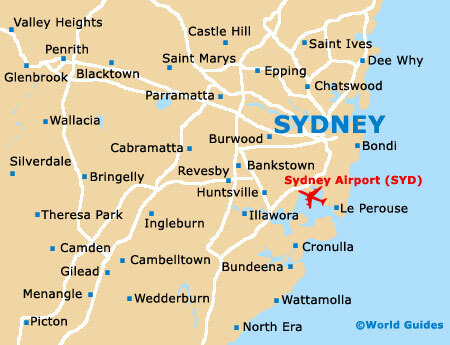 Neighbouring attractions include the Royal Botanic Gardens and the Opera House. The Gould Galleries has grown to become one of the largest commercial art dealers in the city. Regularly managing the collections of corporate and high-profile clients, the Gould exhibits many splendid paintings from both local Australian and international artists, dating back to the 19th century. Concentrating on Australia's historic Aboriginal art, the Hogarth Galleries offers regular temporary exhibitions, contemporary paintings by many renowned artists and appealing sculptures. The Hogarth is easy to find, being situated on Walker Lane and within the Paddington area. The Josef Lebovic Gallery ranks amongst the area's most highly regarded galleries, specialising in historic art work, prints, sketches and photography dating back to the 19th century. With regular temporary exhibitions, this popular space also features more modern paintings and prints, often by local Aussie artists. The Manly Art Gallery and Museum, in the Northern Beach region of Sydney, is close to Oceanworld and is situated on the shore of Manly Cove. This small and interesting museum concentrates on the city's special relationship with Manly Beach and features many exhibitions with beachfront themes and shorelines. With a vast collection of almost 1,000 paintings, including historic Aboriginal works, sculptures and ceramics, the Manly Art Gallery and Museum also have a number of exhibitions about the Manly area, with many local artefacts and displays. Other points of interest include seasonal events and many temporary exhibitions. The Ray Hughes Gallery, in the eastern suburbs, is home to a variety of contemporary Australian and New Zealand art work, with at least two temporary art exhibitions each month. Located in a renovated warehouse, with a vast exhibition space and many other smaller displays, this popular commercial venue includes modern paintings, sculptures and ceramics. Specialising in contemporary art in various mediums, the Roslyn Oxley 9 Gallery stands right next to Trumper Park and is just a relatively short distance from Rushcutters Bay Park. With temporary exhibitions each month, the Roslyn Oxley 9 is worthy of some attention are boasts the works of many highly regarded, famous artists, including many from the city itself. The SH Ervin Gallery, in the Central Business District, is situated in the old National Trust Centre, nearby the Sydney Observatory. This small and interesting centre contains many temporary exhibitions on Australian art, regularly attracting large crowds of art lovers. The SH Ervin is also home to the popular Salon des Refuses show, which is staged here each year. Situated in the eastern suburbs, the Sherman Galleries is an especially important commercial exhibition space, regularly displaying works from many well-known international artists. The Sherman tends to deal mainly in contemporary works. The Tim Olsen Gallery can be found in the Woollahra, close to Centennial Park and the Moncur Reserve. Featuring many exciting contemporary works by Australian artists, the Tim Olsen Gallery is a popular commercial venue, with many unique and affordable paintings and sculptures for sale. The Utopia Art Gallery lies within the Inner West district and specialises in modern Australian art. Exhibitions here regularly feature works by local artists and often include stylish Aboriginal paintings and sculptures.